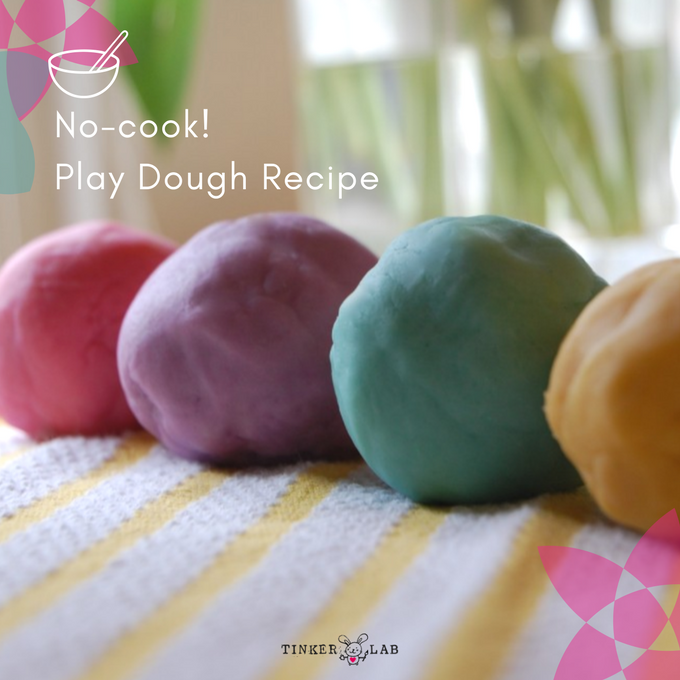 It’s been a while since we’ve made this spectacularly simple no cook playdough, and then I realized that the recipe hasn’t been shared here. 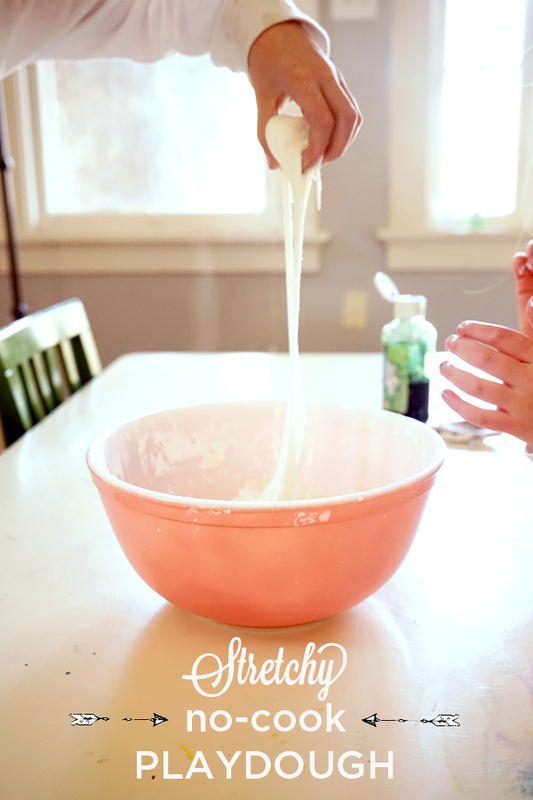 I was first introduced to this easy no cook hair conditioner playdough recipe by Anna of The Imagination Tree, in her recipe for Creamy Coconut Playdough. 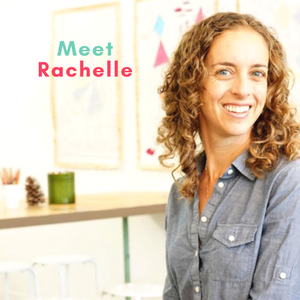 Do check out her blog if you have or work with small children — it’s a gold mine! The ingredients are beyond simple, they come together quickly, and the resulting dough provides children with wonderful sensory and imaginative world experiences. The texture is different from everyday playdough (see the link below to the Best Playdough Ever) – it’s stretchier and a bit stickier. 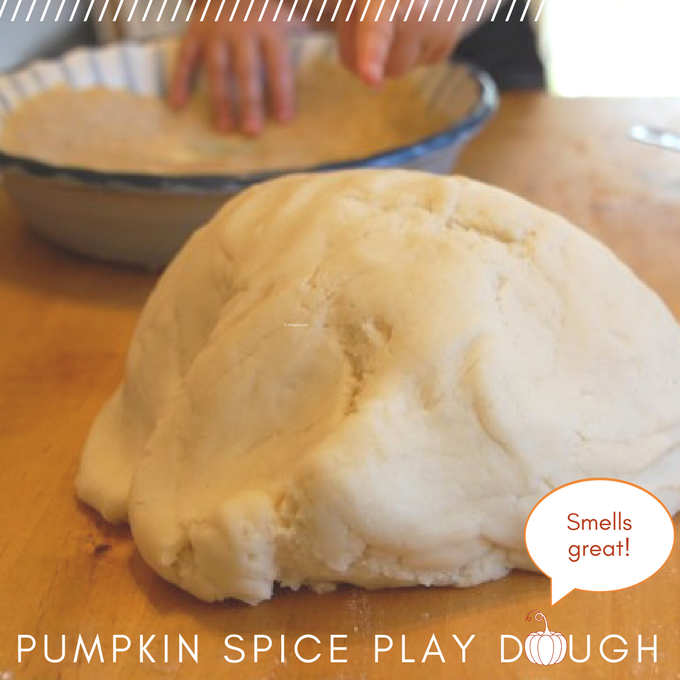 If you’re short on time or have these basic ingredients on hands, this playdough could be for you! 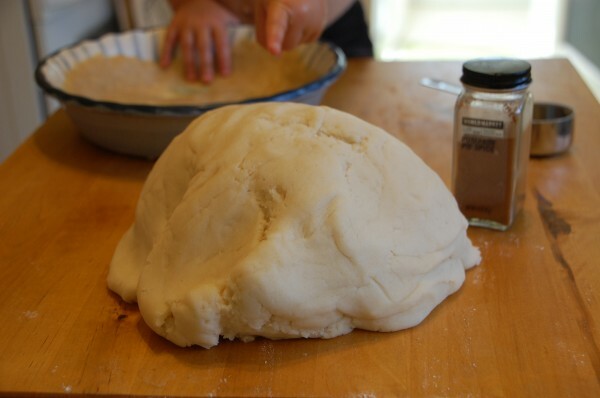 One of my favorite things about introducing a new batch of dough to the kids is seeing how they interpret it. One day they’re interested in building a play bakery around it and another they turn it into horse stables. 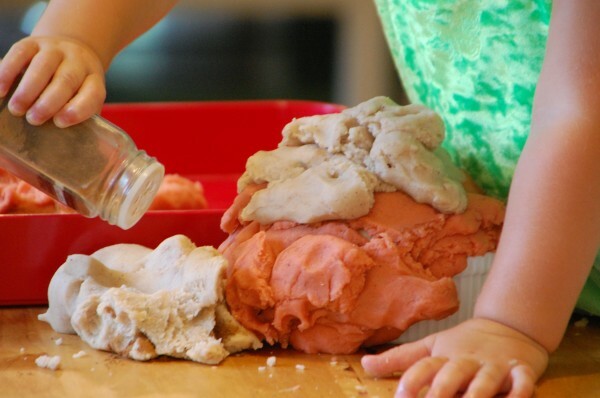 This playdough won’t last for more than a day, so if you’re looking for a long-lasting play dough, you’ll want this recipe for the Best Playdough Ever (seriously – it’s that good). 1 cup hair conditioner: I chose Tresemme Naturals Nourishing Moisture Conditioner (affiliate) for two reasons. One, it’s reasonably priced, and two, it’s silicone-free and dye-free, so I could feel okay with my kids and their friends playing with it. 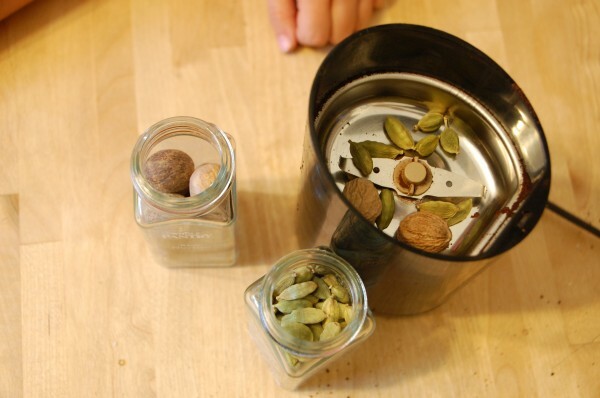 Mix the first two ingredients in a bowl with a spoon. The mixture should not be sticky. 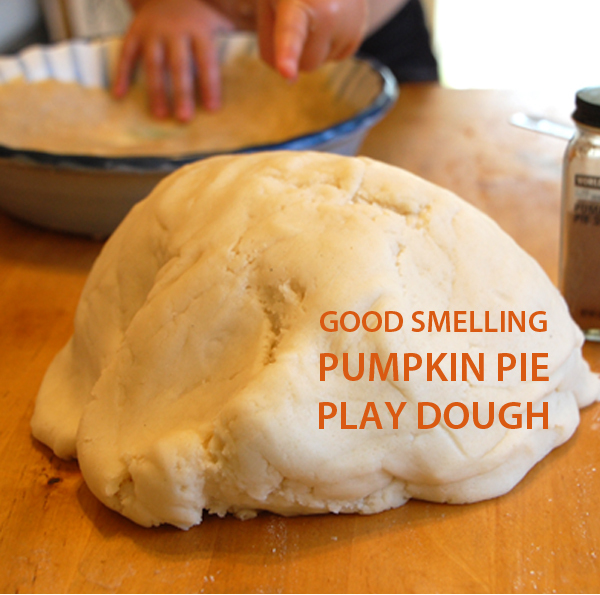 Add a tiny bit more cornstarch if your dough feels sticky. Adjust as necessary. Add a few drops of food coloring or liquid watercolors. Mix. 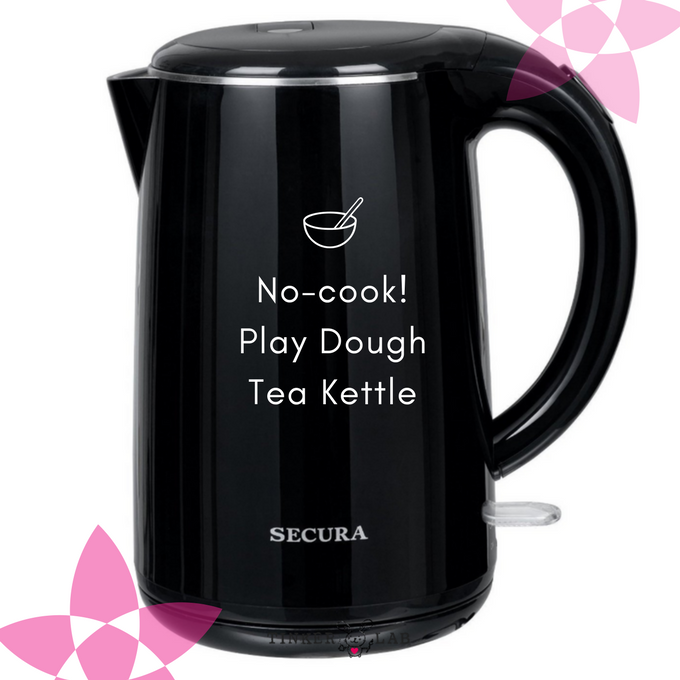 Form the dough into a ball and play! 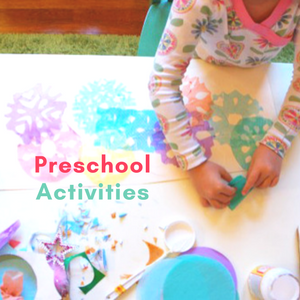 Add rolling pins, small toys, muffin tins, or popsicle sticks and encourage imaginative play. 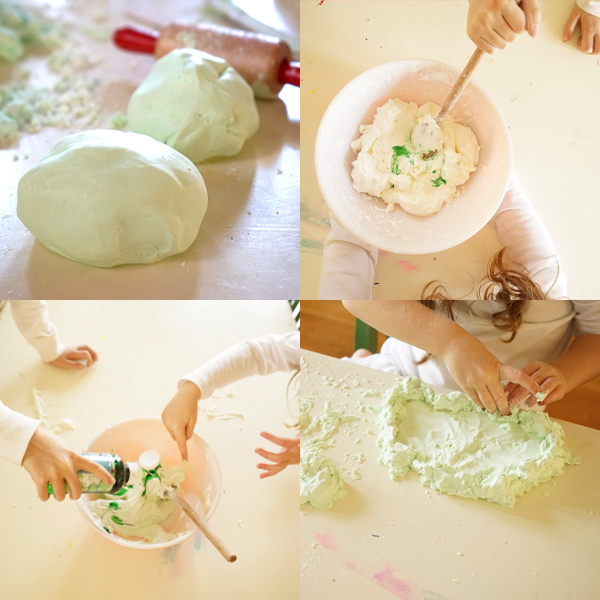 More playdough tool ideas can be found in this post, 3 Essential Playdough Tools and in Playdough Tool Ideas. 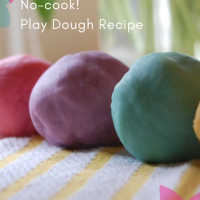 This no cook playdough has a lovely soapy smell. If you’re smell-sensitive, be sure to use a hair conditioner that you enjoy the smell of. I’m cost-conscious, and we made this another time with a cheaper conditioner. The dough turned out great, but I couldn’t escape the saturated, artificial smell of it, and could not wait to throw it out. Wah. I enjoyed the smell of this Tresemme conditioner, and as you’ll read in the Amazon reviews (link above), a LOT of people are happy with this product. Bonus: leftover conditioner can go right into your shower! It helped me hone in on my point of view on this beloved topic (Cliff Note version — Because artists think like inventors, an arts education has the capacity to build innovators). Hopefully I’ll have more for you about the keynote soon. The talk was a success, but the hardest part about this busy time is that I put so many things on the back burner, including all of the fun activities that this blog is built upon. My kids are now largely self-sufficient when it comes to making and inventing, but they also love to spend time tinkering with me. 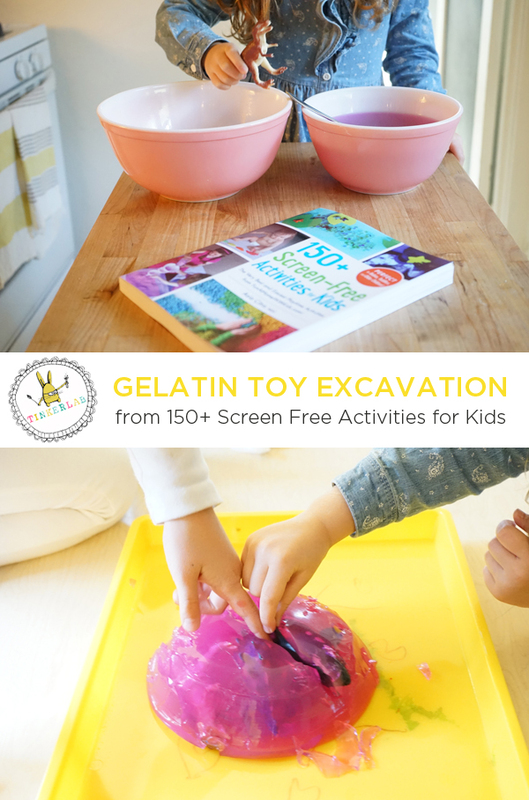 And so, within minutes after coming home from the talk, my 4-year old and I pulled out 150+ Screen-Free Activities for Kids (affiliate) and got busy making up a big batch of colorful gelatin. Why? 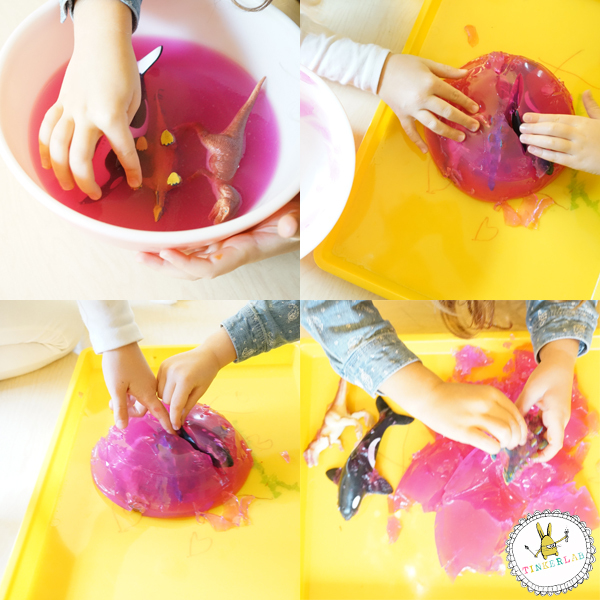 So that we could play with gelatin, of course! 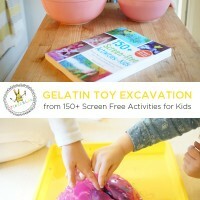 150+ Screen-Free Activities for Kids is a wonderful recipe and activity book that’s filled with “the very best and easiest playtime activities from FunAtHomeWithKids.com“. The author, Asia Citro, is an experience teacher with a strong science and education background, who is here to make parenting a little easier and a lot more fun with her new book. She also happens to be a friend of mine, and I think she’s even more rad now that I have my hands on her amazing book. 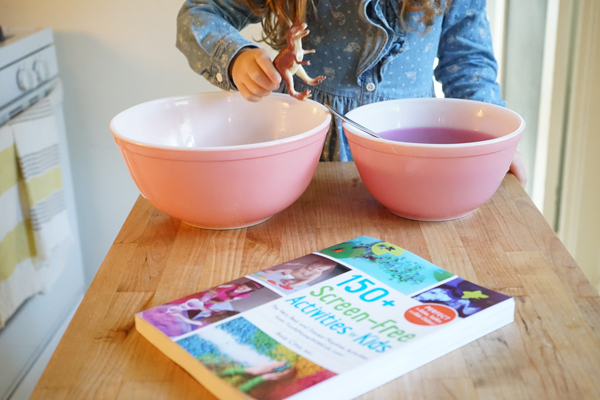 My older daughter and I made this recipe a few years ago, with a slightly different twist that was built around injecting clear Jell-o with colored water, and it was fun to revisit this with my little one (who’s growing way too fast, by the way!). Sprinkle 4 packets of Knox Gelatine over the cold water. Let it rest for one minute. Add 3 cups of hot water to the bowl and stir until the gelatin dissolves. 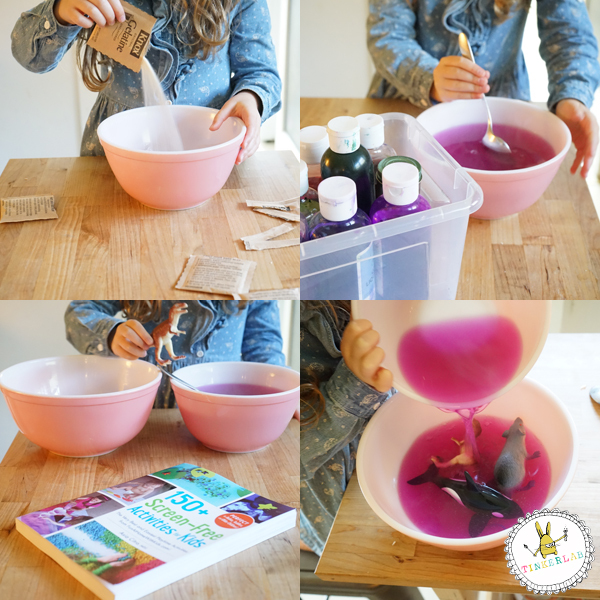 Mix food coloring or liquid watercolors into the gelatin mixture. 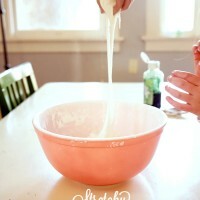 Coat another mixing bowl with cooking spray or oil. Pour the gelatin mixture over the toys. Place in the fridge for about 3 hours, or until it sets. 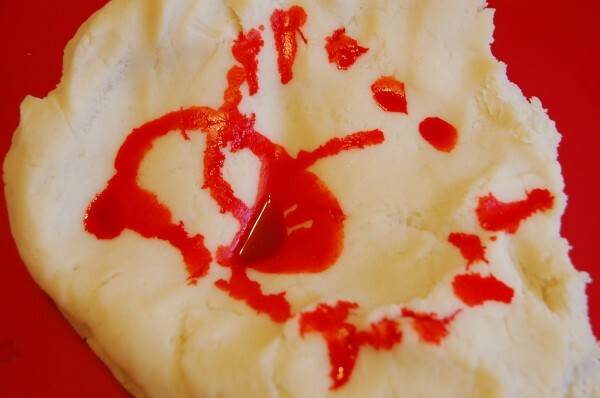 Remove gelatin from the mold. I ran a dull knife around the edges to help release the gelatin. Melt it all down an refrigerate again for more gelatin play. 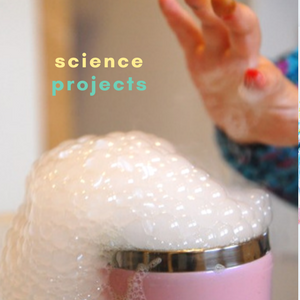 The last time I shared this project some readers found it ironic that we submerged toy animals in gelatin. I know, I thought about that too. If you’re not comfortable working with animal-based gelatin, this vegan jelly seems like a great option. Asia’s book, by the way, is fabulous. Go on and give it a look-see. And take a peek at my new book, too, while you’re there! 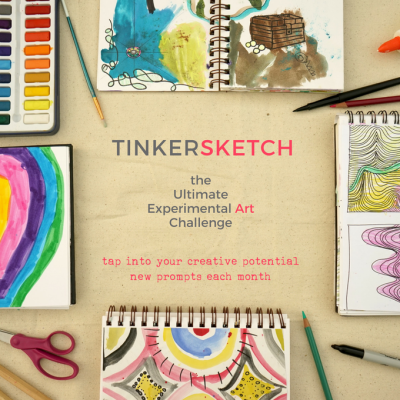 If you were inspired by this post, you might like to sign up for the weekly TinkerLab newsletter. It’s free and we often send exclusive content and opportunities that are only available to our subscribers. After seeing so much lovely colored rice all over my Pinterest feed for ages, it was high time that we created our own colorful rice. 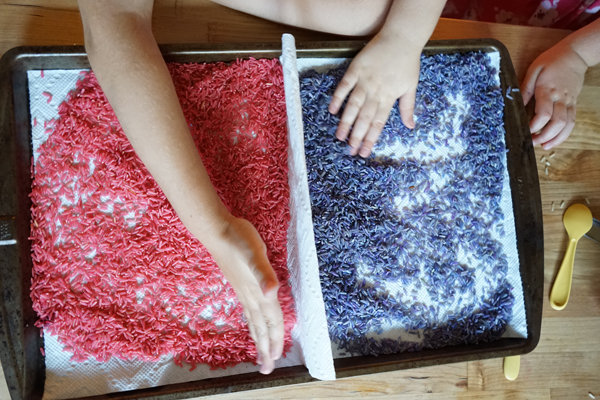 And you, too, can make your own colored rice for an afternoon of sensory play or for filling clear jars with layers of rainbow rice like you see here. Can we use brown rice? We used brown rice for this activity, and the colors are still vibrant. What’s the rice : vinegar ratio? For each color that we made, we used 1 cup of rice and 1 teaspoon of vinegar. That’s the ratio that you’ll want to work with (or experiment — we encourage that too!). If you’re concerned about wasting food, check your pantry for old rice. That’s what we did, and low-and-behold, we had a bag that expired last year. Eeep. I wish we hadn’t missed the expiration date, but at least we could put that rice to good use! Will my kids actually enjoy this? Yes, I bet they will! 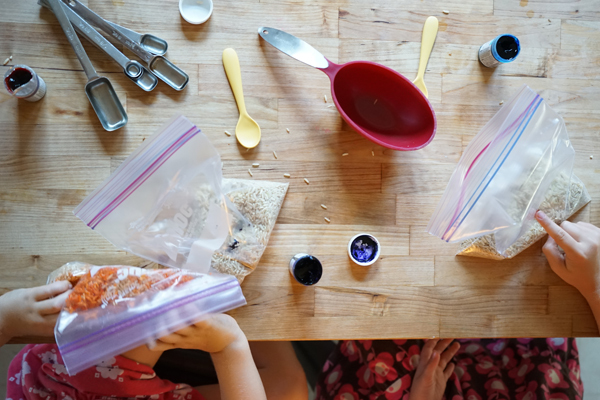 I try to get my own kids involved in all the steps of our projects, and they enjoyed everything from this ro-sham-bo face-off to decide who would make which color of rice to finally playing with their colorful creation. If you’d like to make this recipe, simply click ‘Print” and you can save this in your recipe file. 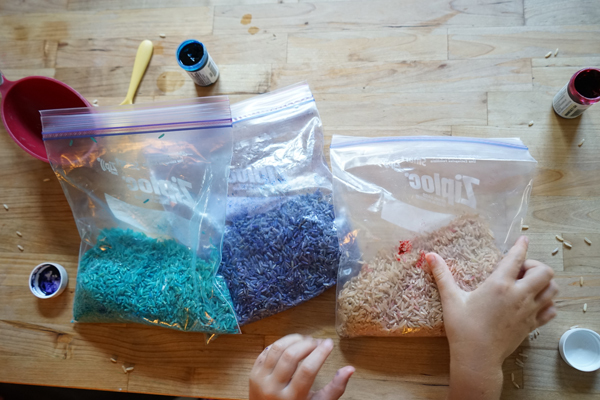 Make your own colored rice for sensory play or art-making. This recipe makes one cup of colorful rice. Add more rice for more colors. Fill a zip-up bag with 1 cup of rice and 1 teaspoon of vinegar. Scoop or pour about 1/8 teaspoon food coloring into the bag. Add more food coloring to reach the desired color. 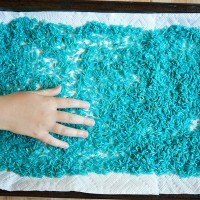 Pour the colored rice onto a cookie sheet. Spread it out to expedite drying time. To absorb the moisture and help the rice dry more quickly, line the tray with a paper towel or towel. The rice take between 2 hours and a full day to dry, depending on your climate and humidity. Fill each zip-up bag with 1 cup of rice and 1 teaspoon of vinegar. Pour the colored rice onto a cookie sheet. 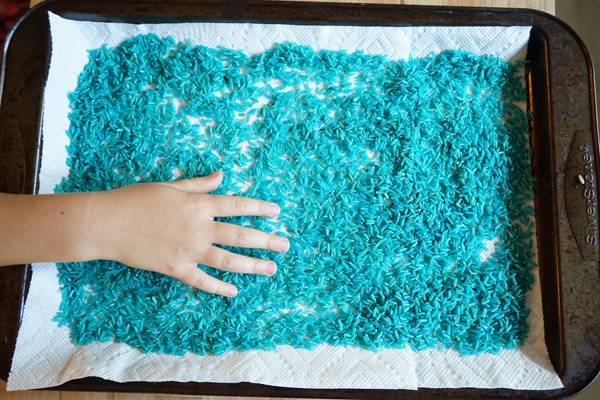 To absorb the moisture and help the rice dry more quickly, line the tray with a paper towel or towel. We ran out of cookie sheets, so we divided one in half by pulling a paper towel wall up between two colors. Our rice dried in about 5 hours. The rice will dry take up to 24 hours to dry, depending on your climate and humidity. 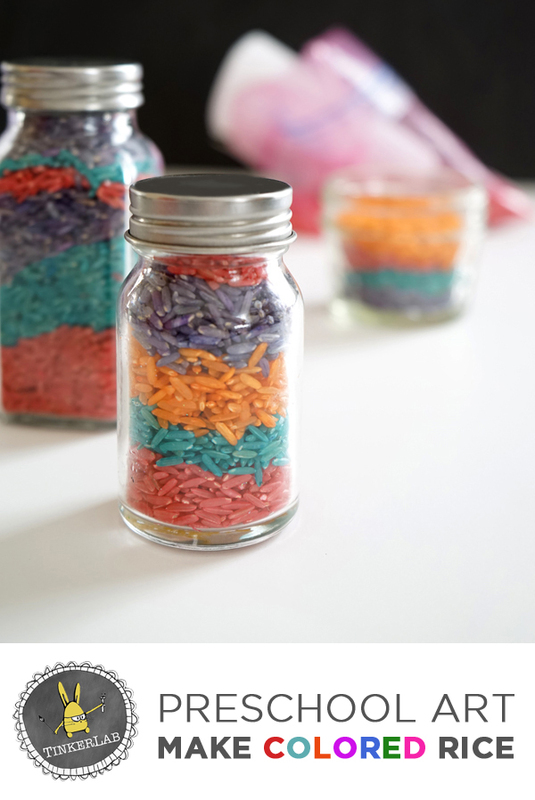 Check back tomorrow and we’ll share a Creative Table set-up using colored rice! Let your walks now be a little more adventurous. 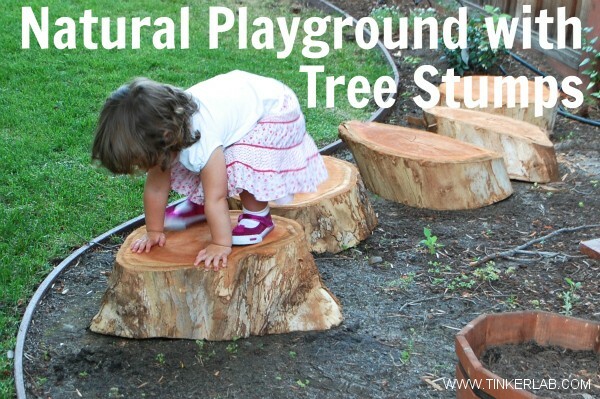 Do you have a natural playground in your yard or near your home? 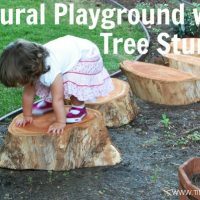 A natural playground is an outdoor play area that’s landscaped with materials such as logs, dirt, grassy hills, sand, natural bridges, and streams instead of plastic playground equipment. Aside from our beloved plastic playhouse, our small suburban garden is full of natural loose parts and I’m constantly looking for ways to develop it into an inspiring, open-ended, natural play area. 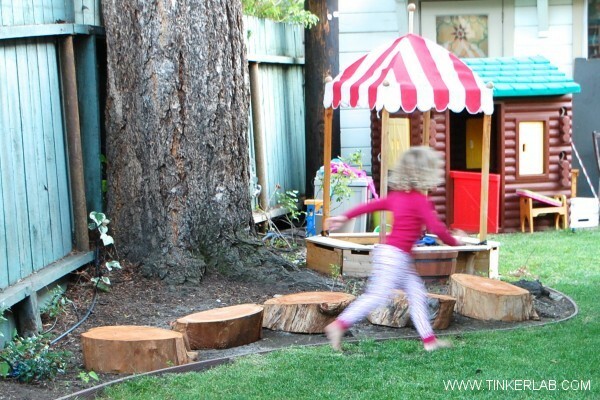 Why a natural play scape? In Children’s Outdoor Play and Learning Environment: Returning to Nature, playground designers and early childhood experts Randy White and Vicki Stoecklin, found that when given the option of imagining an ideal outdoor play space, children would choose things like water, sand, and vegetation over jungle gyms and slide; a surprising conclusion considering what most of our neighborhood parks actually look like. The reason? “Traditional playgrounds with fixed equipment do not offer children opportunities to play creatively (Walsh, P. (1993). Fixed equipment – a time for change. Australian Journal of Early Childhood, 18(2), 23­29.) and promote competition rather than co­operation (Barbour, A. (1999). The impact of playground design on the play behaviors of children with differing levels of physical competence. Early Childhood Research Quarterly, 14(1), 75­98.). Tree stumps are useful for walking on, turning into seating for impromptu fairy tea parties, using as a base for bridges or tables. We live near a children’s museum with a large-scale spiral tree stump path that will entertain my kids for hours. 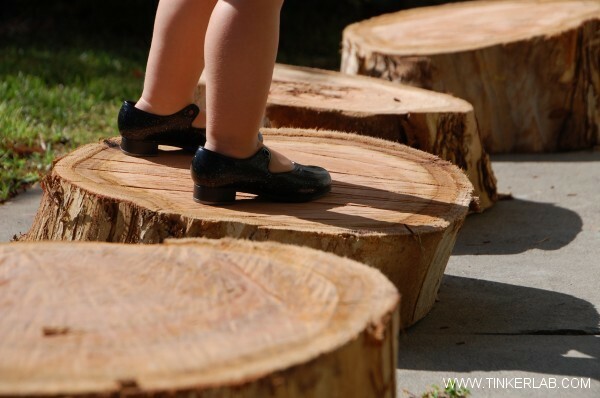 The stumps are of various heights that challenge children to climb, crawl, skip, walk, and jump. When they bump up against each other, as they move in opposite directions, they have to negotiate the space and make concessions. In short, it’s brilliant. 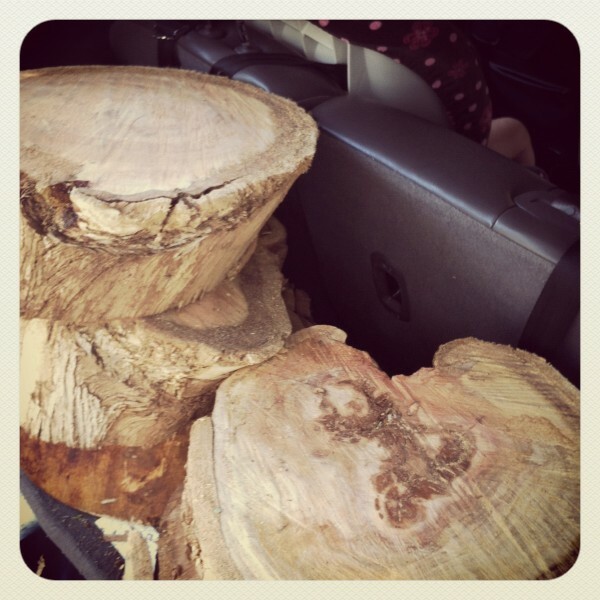 Ever since I first discovered this neighborhood treasure, I’ve been on the hunt for some tree stumps of our own. No small feat, though! We don’t own a chain saw, our trees never get trimmed, and I had no idea where I could find these beauties. My radar was tuned and then low-and-behold, I spotted these guys, hard at work. I asked them if they would be so kind as to share a few pieces with my stump-loving kids, and they said yes. I’m indebted. My car was soon overloaded with heavy lumber and I was beaming! So how do you find tree stumps? This one stumped me for some time (how could that pun not be intended?). I was on the lookout for tree trimmers, and lucked out that my trunk was empty and these guys were generous with their time and muscles. 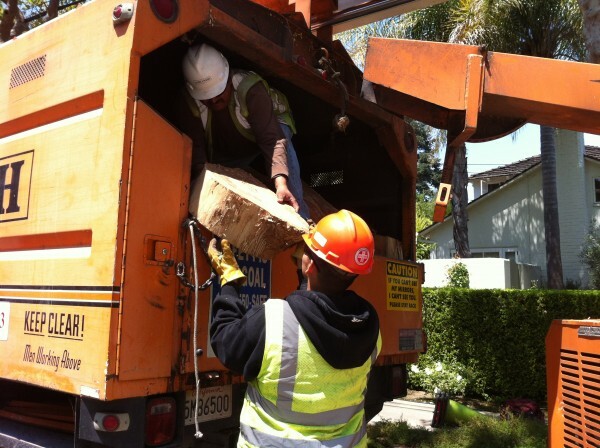 I would caution you that trees can be infested with termites or other dreadful bugs and diseases, so it could pay to secure your stumps at a cost from a local lumber yard. These stumps appeared to come from a healthy tree that was getting trimmed away from a power line, but I’m no tree expert. If you know more about this than me, please let me know if our stumps are healthy! I got these beauties home and my kids wanted to play with them right away (notice the tap shoes — ha! — these two crack me up). I put the stumps in our front yard until we could find a good place for them, and of course our next door neighbor friends wanted to come over and play too. I think I have a good spot for them now, in the dirt and under a tree, and I’ll share more of our natural play scape ideas as it comes together.